President Donald Trump proposed changes to the rules of origin for autos. The proposed rules were viewed as untenable for automakers, as well as Mexico and Canada. 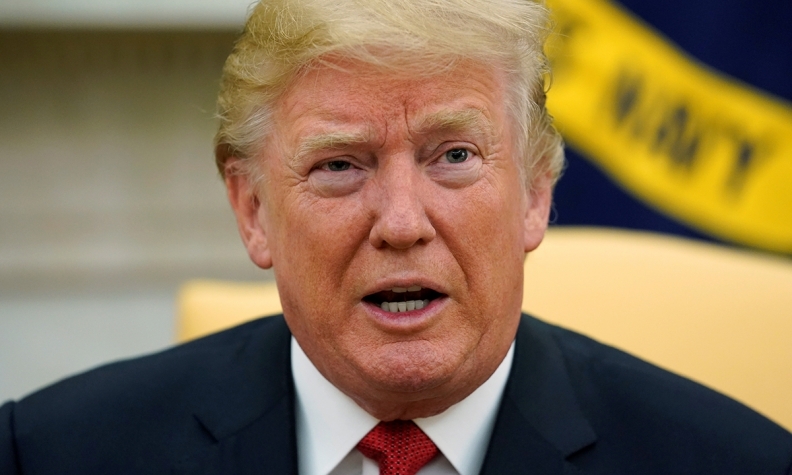 WASHINGTON — A sequence of temperate comments from U.S. President Donald Trump’s are easing concerns among free-trade proponents that he will blow up the deal. Trump made about a half-dozen such remarks to The Wall Street Journal — soothing context after days of blazing speculation in Canada, fuelled by news reports that said Trump might be planning to issue a notice of withdrawal from NAFTA sometime after this month's round of bargaining. A transcript of the interview shows Trump saying of the negotiations: "We're moving along nicely," "There's no rush," "I'm leaving it a little flexible," "We have a chance of making a reasonable deal," "We've made a lot of headway." The benefits of a new NAFTA would also pay for his proposed border wall with Mexico, added Trump, who said he understands it's tough for Mexico to negotiate during its current election. Yes, he repeated his threat to cancel the agreement if he can't get a better deal. Observers still view a U.S. withdrawal notice as a potential bargaining ploy at some point. But his comments were viewed as overwhelmingly pointing against an imminent pullout. "I thought that was a sensible suggestion from the president," said Foreign Affairs Minister Chrystia Freeland, when asked about Trump's apparent willingness to take more time to negotiate. "That was a good, constructive proposal from the president." Freeland said Canada has always believed it's unhelpful to impose artificial deadlines on the talks, which are currently set to end in March. Canada is prepared to spend as much time as it takes to get a good deal, she added. Mexico's Economy Minister Ildefonso Guajardo made similar comments. He told the newspaper El Pais that he interpreted the president's remarks as meaning a notice of termination does not appear imminent. Some Americans have been detecting lately that the pro-NAFTA lobby effort is working. "The president is getting enormous pressure from within the United States. From members of his own party, from the agriculture community, from the business community, from states where he won the presidency," said Robert Holleyman, former deputy trade czar under Barack Obama. "He's getting very big pressure to make sure NAFTA does not fall apart." Farmers have already been hit with commodities plunges and have been pleading with the president — through members of Congress and senior members of his administration — not to compound the crisis by threatening exports. Farm states have warned him that triggering the NAFTA withdrawal clause to scare Canada and Mexico into concessions would backfire — they say it would also scare foreign buyers of American goods, leading them to seek new suppliers. Trump appeared at a farm conference this week and made less-aggressive-than-usual remarks about NAFTA. Canada-U.S. trade lawyer Dan Ujczo was at that conference — then got on a plane to Canada. When he landed, he was surprised to hear the urgent tone of news reporting suggesting a pullout was imminent. "I was stunned," said Ujczo. "I think over the last months he's picked up that there is a potential cost." There's still a chance Trump will eventually trigger NAFTA's Article 2205, which allows a country to leave after six months' notice, Ujczo said. The president said he believes it would be his most powerful negotiating tool. He'll need to decide whether to deploy it by spring, when the current schedule of rounds expires and the U.S. Congress debates extending a fast-track law setting rules for trade negotiations. It's crucial to show progress by then, Ujczo said. As long as there's forward momentum at the upcoming talks in Montreal, which get underway Jan. 23, he said it's less likely Trump will touch the exit button. "I think the president is starting to realize that the notice to withdraw is less a negotiating tactic — and more a Pandora's box," Ujczo said. "You may not be able to put the NAFTA back into that box once it's open, and anti-trade momentum takes over... (And) I don't think this administration has any intention to (truly) withdraw from NAFTA." Meanwhile, Freeland said on Jan. 11 that Canada would bring “new ideas” for “unconventional” U.S. proposals, though she didn’t say which. One of the government officials said she was referring to the auto sector. Both officials said Canada would not give a full autos counter-proposal, and spoke on condition they not be identified. The United States has proposed a vehicle require a higher percentage of North American content to be eligible for duty-free status. The United States also wants 50 per cent of that content to be American.